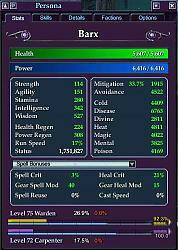 EQ2Interface : Persona Window - New Spell Mods! : Persona Window - New Spell Mods! Category: Persona windowPersona Window - New Spell Mods! Name: Persona Window - New Spell Mods! This adds the 'Gear Spell Mod' and 'Gear Heal Mod' stats to the "Spell Bonuses" option in the persona window. These are the bonuses to damage and heals that your equipment gives you. Please note that this will *not* include other sources of increased damage, only the bonuses from the +n spell damage or +n heal stats on your equipment. This also makes the spell bonuses appear by default instead of the melee bonuses. To install, simply unzip and overwrite the old version.